NASHVILLE, Tenn. — The Wright State women’s basketball team rounded out their trip to Nashville in the Challenge in Music City Nov. 25 as they faced off against Marist. 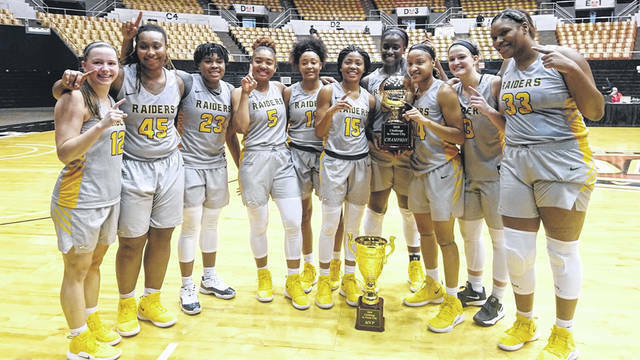 After trailing at halftime for the second straight game, the Raiders again blew the game wide open in the second half to capture the Broadway Bracket title, as well as their third straight victory overall by a score of 76-60. Imani Partlow came off the bench to lead WSU with 17 points as three others scored in double figures: Tyler Frierson 12, Emily Vogelpohl 11 and Mackenzie Tayloer 10. Symone Simmons grabbed 11 rebounds as the Raiders dominated on the boards 39-25. It was Marist’s first loss of the season (5-1) while the Raider go to 4-3. Behind strong first half performances from Imani Partlow and Tyler Frierson, the Raiders were able to hang in Sunday’s contest, despite shooting just 40 percent from the floor. Frierson and Partlow both ended the half with eight points to lead the Raiders, who trailed the Red Foxes by just three points heading into the halftime locker room. The Raiders came out inspired in the second half of Sunday’s game, opening up an 11-point advantage in the third quarter alone. Wright State improved their shooting from the field to over 50 percent in the second half, allowing them to run away from Marist in the third quarter and beyond. The Raiders (4-3) will be in action 2 p.m. Sunday, Dec. 2 against Kent State. Women’s basketball tickets can be bought at the gate for $3 and $5 for adults and youths. WSU students are free. For more information and group rates, call 937-775-4934 or email www.raidertix@wright.edu.